Tours in Mergui Archipelago varies as its attractions. Mergui Archipelago is famous for its pristine beauty above and below water, on and off its myriads of islands. Embark to Mergui Princess 1 to start the exploration tour to the untouched islands of Mergui Archipelago. Depart Kawthaung from Myoma Jetty to 115 Island. Arrive at 115 island. Take a rest while the crew and the cook prepare for the tents and foods for lunch. Check-in at the prepared tents to overnight on island. Enjoy the sea food lunch on beach. After lunch, free at leisure to explore the beauties of this virgin island. Exciting activities are like sea kayaking around the island, snorkeling, fishing, jungle trekking, swimming and sun bathing on the beach. Enjoy the BarbeQ Dinner on beach. After dinner, enjoy the stars and the peace of Adaman Sea. Overnight on beach or onboard. Enjoy your breakfast prepared by the Chef of Mergui Princess 1. After breakfast, continue to Makyone Galet Salone (Moken) Village. Arrive at Makyone Galet Village. After walking around the village, back to the boat for lunch. After lunch, depart to the eastern side of the Lampi Island for anchoring. Enjoy around one of the island?s 3 rivers to observe the mangroves forest by kayaks without seeing other humans. Evening opt for the sublime peace of deserted white-sand beach of Lampi Island ? the only protected forest and the island of Mergui Archipelago. Enjoy your dinner and overnight onboard or on beach. After breakfast onboard, snorkeling around the beach. After that, depart to from Lampi to Wa Ale Island. After lunch, enjoy another beautiful beach of Mergui Archipelago. One can also do the mountain trekking to find the wild animals of the island such as elephant, tigers, sea turtles, wild pigs, civets, leopards, monkeys, lizards and variety of animals. Enjoy your dinner and overnight onboard. After breakfast onboard, snorkeling near the famous Salet Galet ? a small space between the main Lampi island and Wa Ale. Depart to from Wa Ale Island to Kyun Phi Lar used to be called Great Swinton Island ? one of the most beautiful island in Mergui Archilepago. After lunch, enjoy the activities at your own interest such as swimming and sun bathing on the beach, snorkeling on the corals, sea kayaking and fishing. Enjoy your farewell seafood barbeque dinner and overnight onboard. After breakfast, enjoy the last day of the trip on Great Swinton beach. Depart back to Kawthaung in the late morning. Enjoy Lunch onboard. Cheers up for your successful exploration trip to Mergui Archipelago by opening a complementary Shan pain on approach to Kawthaung Jetty. Early Evening, arrive back to Kawthaung, disembark and transfer to your hotel. Departure time from Ranong is around 04:00 PM on Mergui Princess or similar boat. After pick up one of our diving instructor and our guests in Koh Payam at 06:30 PM, we will leave Saphan-phlar jetty to Koh Tachai island. First day is the day for touch to the blue. We will start our check dive in Koh Tachai which is home for leopard sharks, and nurse sharks. Then we will leave to Koh Bon . Koh Bon and the Pinnacle close with Koh Bon are right spots for Manta Rays. Where we will make our second dive. 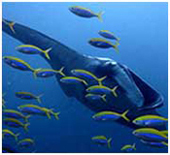 Last season the mantas were spotted year around and sometime we'd seen three and more mantas in a single dive. After second dive we will leave to Similan island, the most famous dive site in Thailand and the home of beautiful coral reef and reef fishes. We will make one fun dive and one night dive in two different dives of northern part of Similan. There will be a good chance to see Manta Ray, Reef Sharks, Napoleons, Barracudas and a lot of small stuff. Second day is the day for big fishes like sharks and rays. We will dive four dive at south and middle of Similan. In evening before sunset we will visit to beautiful beach of Similan island. Third day is the day with the mantas. We will make two quite enjoyable drift dives at very nice dive sites where we can see most attractive coral life in northern part of Similan. Then we go back to Koh Bon pinnacle to see manta rays. And then we will be way back to Koh Tachai pinnacle where we will make our last dive for that day, the dive for Mantas and Whale Sharks. The last day in Thailand is to go to big aquarium. Richchelieu rock is just the remote rock in the middle of sea but it is home to some of the largest marine life species in Thailand and sightings of whale shark, manta ray and sharks are common. We have also chance to see tiny things like sea horse, ghost pipefish, many species of nudibranch. We will make three dives before continue to Kawthaung. Visa process at the immigration point in Kawthaung. * After arrival to Kawthaung, board onto the boat. Depart to Taung La Bo island. And enjoy the activity of snorkeling and swimming near the island for 1 hour. Take a rest while the cook prepares lunch. Enjoy lunch onboard. Continue to H 5 Island. Arrived at 115 island and then free at leisure to explore the beauties of the virgin island. Exciting activities are sea kayaking around the island, snorkeling, fishing, jungle trekking, swimming and sun bathing on the beach. Enjoy the dinner and overnight onboard near 115 island. Enjoy your breakfast prepared by the Chef of Mergui Princess. After breakfast, continue to 254 Island which is small but beautiful with its white sand and semi-circle shaped beach, it is one of the most popular places among tourists. Besides, it is the most beautiful site in the area. There are full of coral reefs in Lamp Island. Various kinds of fish species can be found while snorkeling. Enjoy your dinner onboard and overnight. After breakfast onboard, explore nearby. Depart to Nga Mann Kyunn which has both beautiful hard and soft corals as well as Nurse Shark. A Cave is under water where many kinds of fish can be seen. After lunch on board, continue to Kyun Phila (Great Swinton) which is one of the most popular and beautiful islands in Mergui Archipelago with its beautiful corals for snorkeling. Enjoy Swimming, Fishing and Sun Bathing on the beach. Dinner and overnight onboard nearby Kyun Phila. After breakfast. depart to Bo Yale Island where enjoy snorkeling. And then depart to Myauk Ni Island where you can enjoy the activities such as swimming, sun bathing on the beach, snorkeling around the corals, sea kayaking and fishing along the beautiful long beach. And then depart to Tha Yae Island. 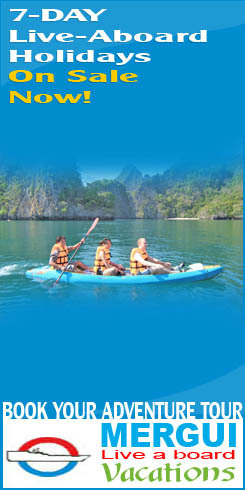 You can go kayaking around Mangrove Forest, sunbathing, camping and overnight on board nearby. Enjoy your breakfast onboard. Then the trip starts back to Kawthaung. Cheers up for your exploration with complementary beer or soft drinks before arriving back to Kawthaung. Then return to Ranong. *NOTE : Myanmar tour permission needs to be done 2 weeks prior to trip. Itinerary mentioned above is only tentative and is subject to guests’ flight timings. 50% deposit paid when bookings is confirmed. These deposits are non-refundable. The rest to be transferred 14 days prior to arrival date. Within 45-30 days prior to the arrival date, 50% of the total price. Within 30-15 days prior to the arrival date, 75% of the total price. Less than 15 days prior to the arrival date, 100% of the total price. In case of No-show - 100% of the total price. A Valid visa is required to enter Myanmar for all the nationalities. Visa can be apply at the Myanmar Embassies in abroad. All the tourist visas are valid for 28 days and cost average of USD 20. Passports must carry a validity of 6 months beyond intended date of departure from Myanmar. Pre-arranged Visa on Arrival could be arranged & take 14 working days to get the approval. Once we get the approval, we will send the copy by fax to clients as well as to the airline ground office to able for the client to get boarding pass. The visa fee is USD 20 and our service charge is USD5 per person. Clients should take out medical and travel insurance. A representative will meet you at your hotel in Kawthaung.